So in this trip report I’ll focus mostly on the things I didn’t write about in great detail at the time. 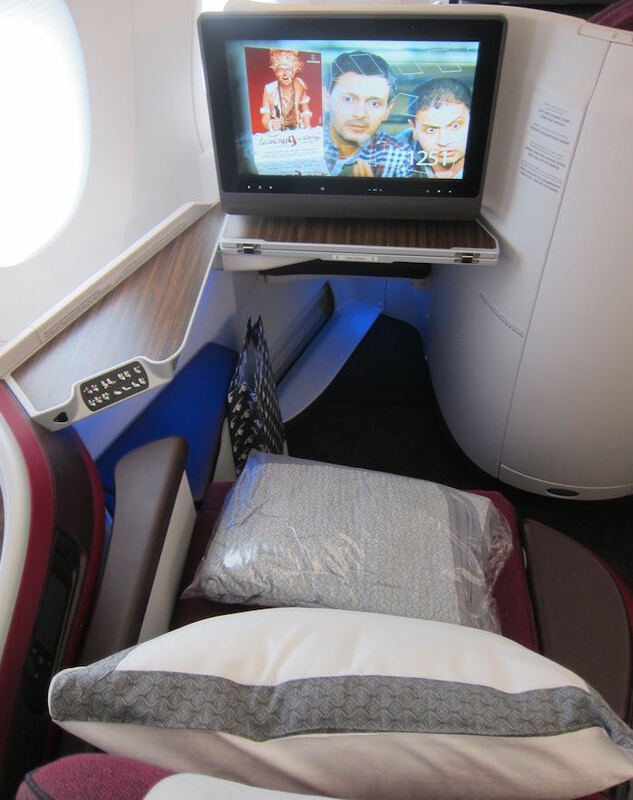 I managed to be the first aboard the Qatar Airways A350, and quickly snagged a few pictures of the cabin. 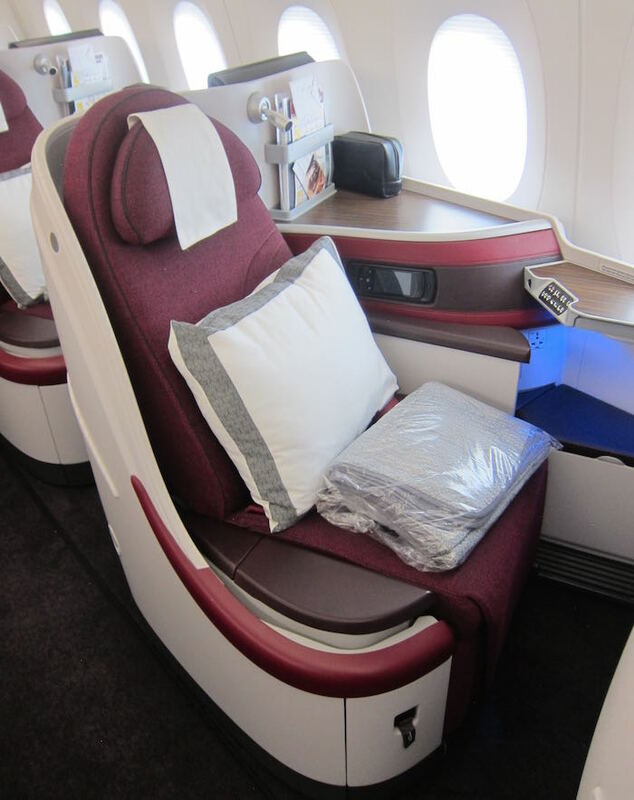 Qatar Airways’ A350 business class features a total of 36 seats. Each seat features direct aisle access, so the configuration is 1-2-1. 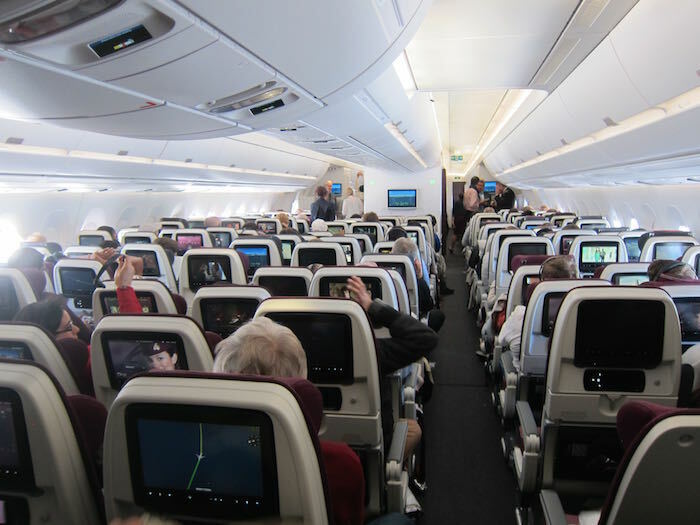 The forward cabin consists of six rows, then there’s the entrance by the second set of doors, and behind that is another three rows of seating. The hard product on the A350 was almost identical to the business class product that Qatar Airways has on the 787 and A380. 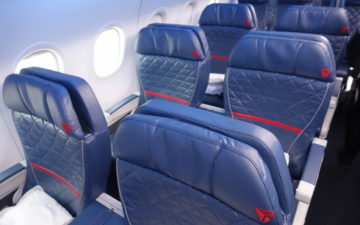 They’re reverse herringbone seats, though they’re different than the ones found on American and Cathay Pacific, for example. 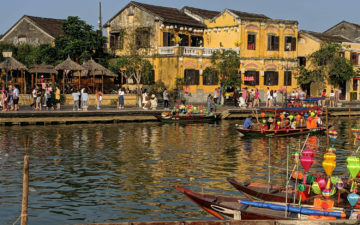 It’s a modified version of the product, which has both its pros and cons. I like the seat a little bit more in theory, I think, though the one downside is that there’s not nearly as much privacy. 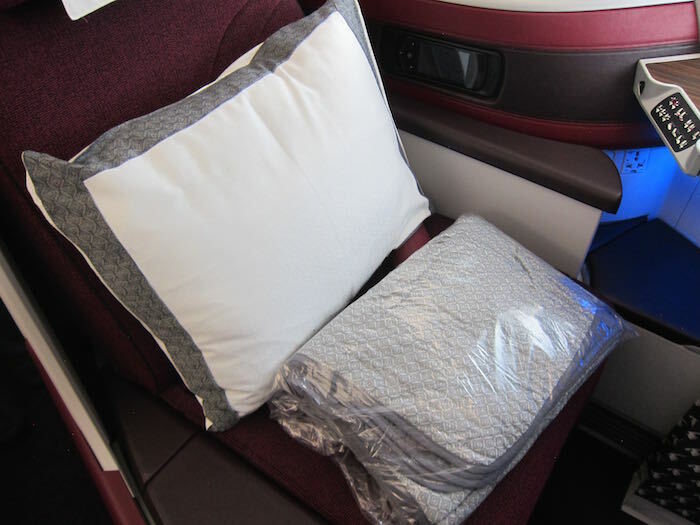 The Cathay Pacific seat has a “widget” of sorts at the side of the seat which adds more privacy, while in Qatar Airways’ version of the seat your head is fully exposed. I was assigned seat 4A, which was about halfway back in the forward cabin on the left side of the aircraft. 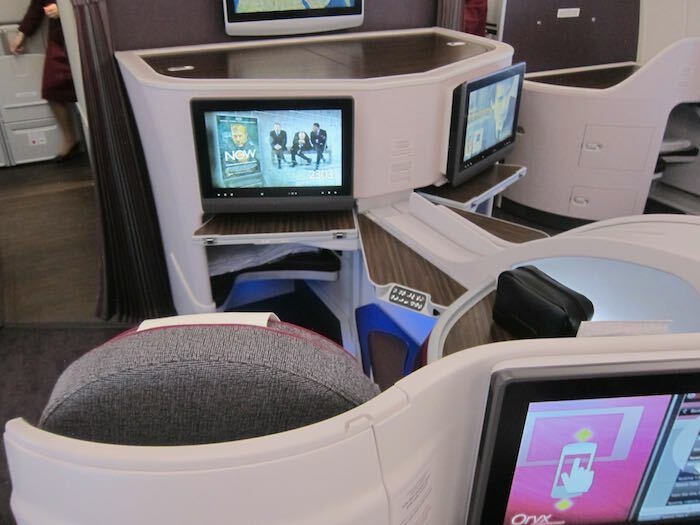 What makes the seat a bit different than some of the other reverse herringbone seats out there is that the entertainment screen doesn’t “fold away,” and the tray table simply slides out from underneath the personal television. 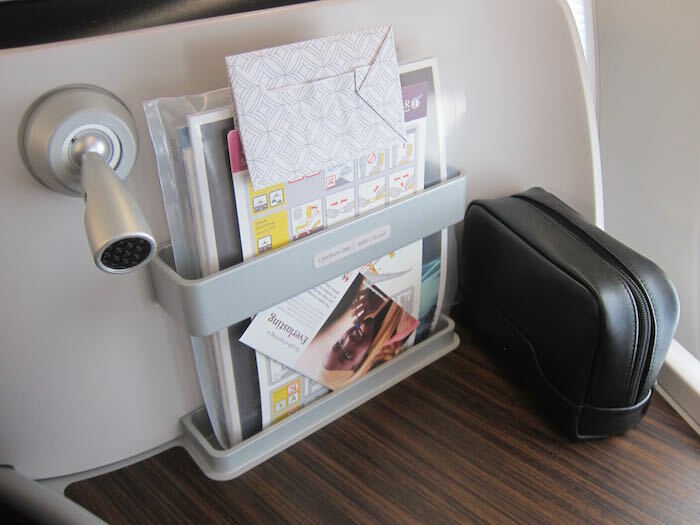 The magazine rack was located to the left of the seat, along with a reading light. An amenity kit was also already waiting at my seat. 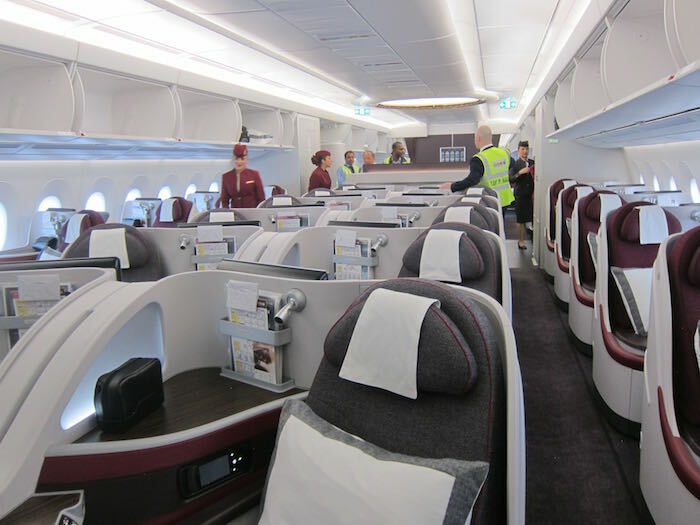 It’s worth noting that the bulkhead had the same cutouts for your feet as any other seat, except it sort of oddly faced the galley (the CEO of Airbus sat in 1E, while the CEO of Qatar Airways sat in 1A). Waiting at each seat was a comfortable pillow and blanket. This was in addition to the additional blanket and mattress pad which were waiting on the ottoman. It’s not often you see a mattress pad in business class on a roughly six hour daytime flight. 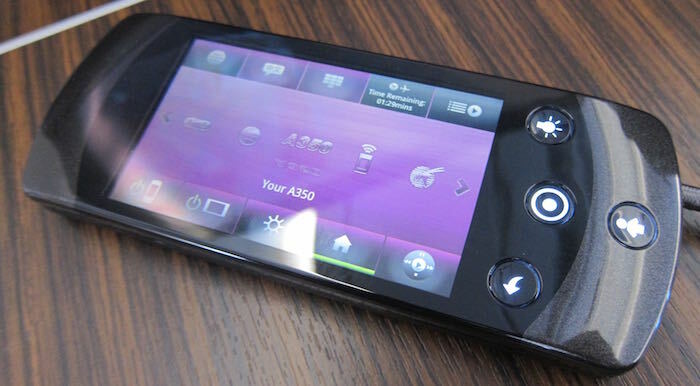 The seat’s entertainment controller was simple to use as well. Once settled in, one of the friendly cabin crew came by to offer me a pre-departure beverage. I ordered champagne. The glass of Billecart-Salmon was poured at my seat, and I was given a hot towel to accompany it. I figured it made for a good photo op with my inaugural flight certificate. Menus were distributed shortly thereafter. I was also offered pajamas. Pajamas on a six hour daytime flight in business class? Wow, impressive! The amenities for this flight really couldn’t be beat. 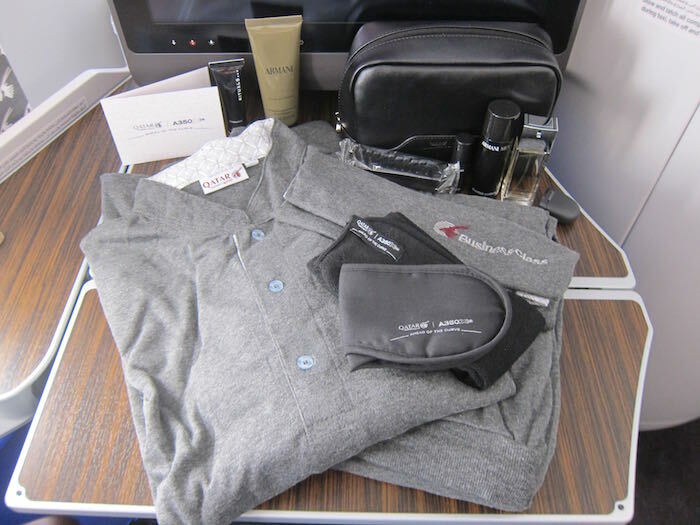 Between the Armani amenity kit (with surprisingly large amounts of goodies), the pajamas, and the A350 branded eyeshades, I felt like I was in first class. 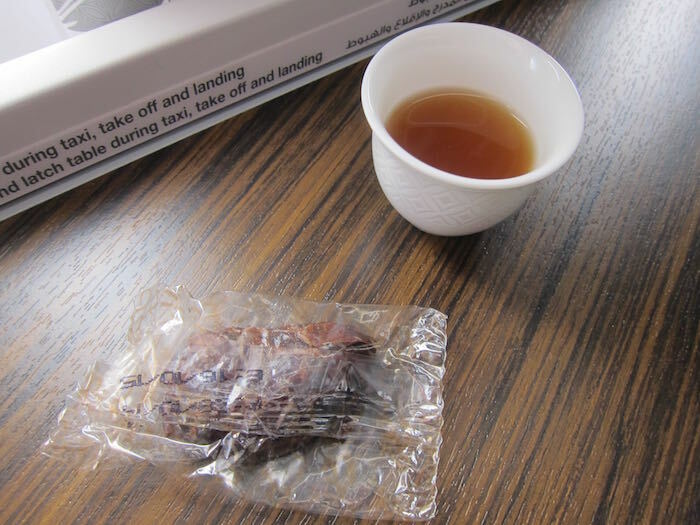 Further into the boarding process I was offered Arabic coffee and a date. On one hand I think it’s kind of cheap looking that they serve packaged dates, on the other hand as a germaphobe I prefer it, since otherwise everyone is grabbing is putting their hands in a basket full of unwrapped dates. The boarding process was a total cluster, though that’s hardly surprising. The crew was doing everything as well as they could, though obviously the cabin was still new to them. Beyond that, they couldn’t have had more insane working conditions, given how many people were trying to take pictures, walk around, etc. Add in the nervousness of having the notorious CEO aboard, and I’m sure they were shaking on the inside. At around 7:40AM the door closed with a completely full business class cabin. Of the 36 passengers, I’d say maybe a third were His Excellency’s entourage, while maybe half were aviation enthusiasts, and then there were a few passengers that “accidentally” booked the inaugural flight. At this point Diana, the cabin service manager, made her welcome aboard announcement. Shortly thereafter the captain welcomed everyone aboard — “on behalf of His Excellency, Mr. Akbar Al Baker, and your crew, it’s my honor and privilege to welcome you onboard this inaugural A350 flight.” He informed us that our flight time was 5hr55min, which he anticipated would put us into Frankfurt a bit early. The seatbelt sign was switched on, which in and of itself is a pretty cool feature. The seatbelt sign is an electronic display, and even has text that appears at the top of the screen. At around 7:50AM we began our taxi towards runway 34L. 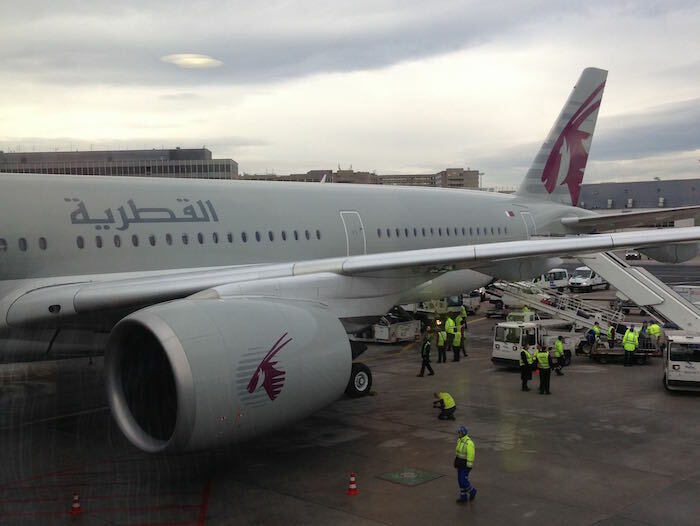 We taxied past a lot of other Qatar Airways aircraft parked at the terminal, including an A380, and then several A330s and 777s. We got to runway 34L at 8:05AM, at which point we were immediately cleared for takeoff. I should note that the A350 tail camera is amazing. It’s the most high def and wide angle tail camera I’ve ever seen. 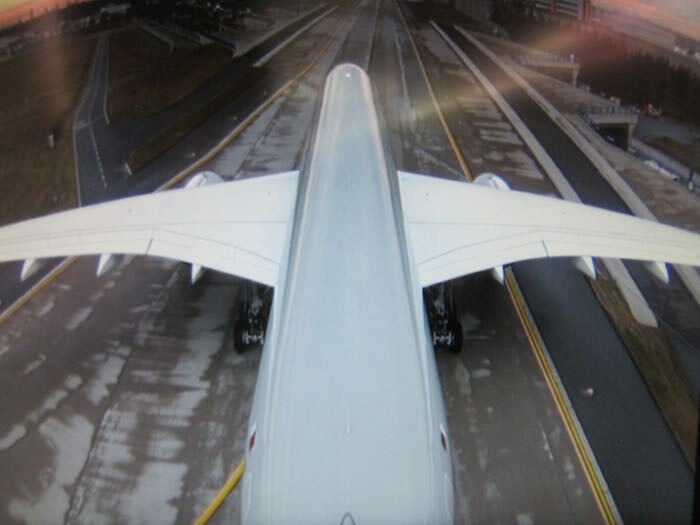 Some A380 tail cameras are pretty “crisp,” though this one provides an exponentially clearer picture. Once we lined up on the runway we had a smooth and quiet climb out. I don’t think I can properly express how quiet the A350 is. It’s even quieter than the A380, which otherwise already felt like the quietest plane, by far. 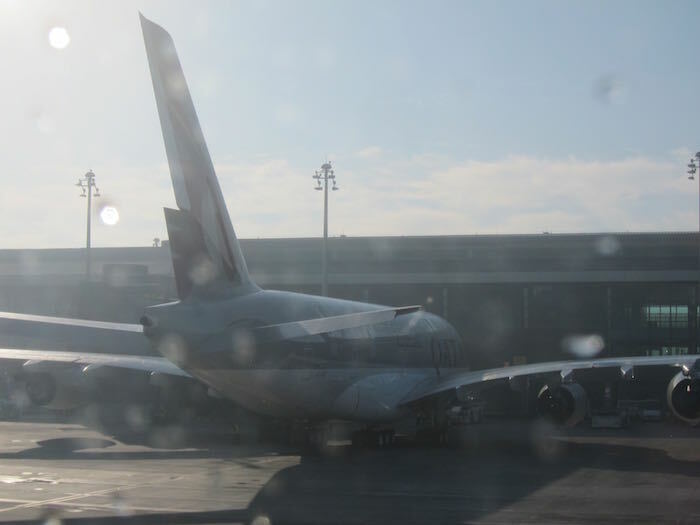 Our climb out was gradual and smooth, and we had an awesome view of Doha on the left side of the aircraft. The seatbelt sign was turned off about 10 minutes after takeoff, at which point cards were distributed with complimentary wifi codes. While the aircraft was equipped with OnAir wifi, it was the worst quality connection I’ve ever experienced. It only worked for a few minutes throughout the entire flight, and even then I could barely upload a picture to Instagram. Shortly thereafter breakfast orders were taken, so I placed my order. 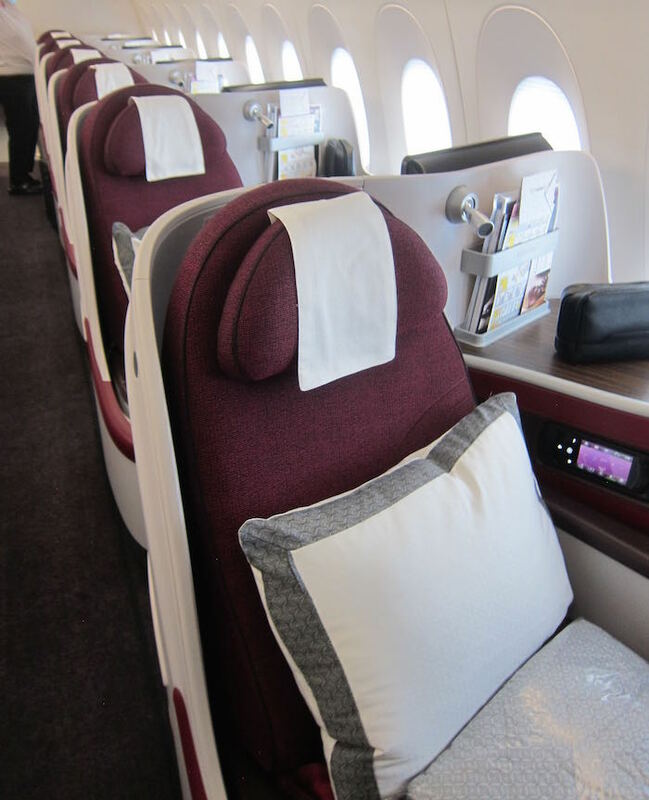 I have to say that Qatar Airways’ reverse herringbone seats look especially gorgeous from behind, in part thanks to the lack of “head” privacy. You can see what everyone is watching on their IFE. The A350 wing is quite gorgeous and special as well. I quickly checked out the lav. 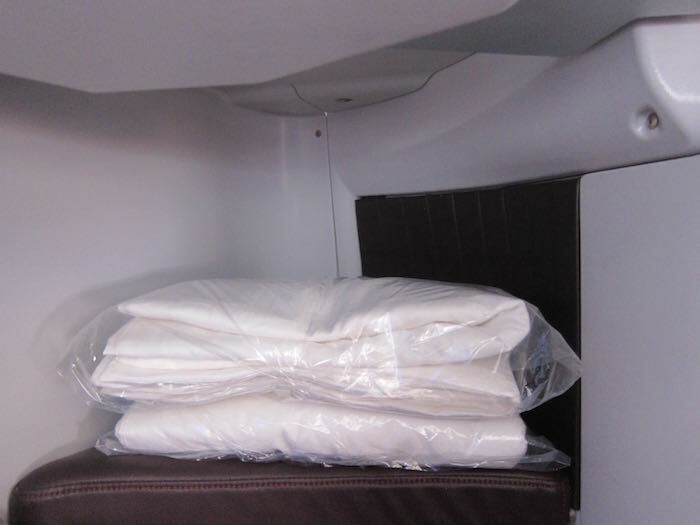 There are two lavatories located between the forward and rear business class cabins. They’re nicely appointed, though not especially spacious. At this point many of us gathered in the “open space,” located between the two business class cabins. It’s not intended to be a bar, really, though they do have a small setup with snacks, flowers, etc., and they’ll gladly bring you drinks there. There’s a pretty cool ceiling “dome” located above this area. Per our request, they also gladly placed a bottle (or 10) of champagne in the area with an ice bucket. I really couldn’t have asked for a more fun crowd to fly with. There were so many aviation geeks aboard. Some I knew from past inaugural flights, while others I knew from online but had never met. It was simply an awesome crowd. Rather than having breakfast right away, a handful of us instead started with a liquid breakfast. Meanwhile my favorite TV travel guy, Richard Quest, was conducting interviews on the flight, including with the CEOs of Qatar Airways and Airbus. After indulging in a drink (or seven), I headed back to my seat for breakfast. Service began with the table being set, which included a glass of still water and a pastry basket. For the first course I had a fruit plate with honey creme fraiche, which was delicious. After that I had another starter consisting of cured salmon. Again, it was fantastic. Qatar Airways has among the best catering in the industry, in my opinion. For the main course I ordered the Arabic breakfast. It was okay, though unmemorable. The main plate seemed a bit odd — I felt like it was missing something. Meanwhile my friend Kelly, who was seated in front of me, had ordered the frittata. Service throughout the meal was really, really, really slow. And the crew was trying their best and they even consistently apologized for how long everything took, but it was clear they were overworked, overwhelmed, and just didn’t yet have a “rhythm” for the A350. The above three courses literally took over two hours to serve, and even though I ordered a cappuccino with the starter, it was only served after my last course was cleared (despite me following up about it). The views out the window during breakfast were breathtaking, especially as we were flying over Iran. The crew also provided turndown service. Between the mattress pad and comfortable pillow and blanket, that’s fairly impressive for a short daytime flight. The CEO insisted that this was a new standard service offering. We spent much of the rest of the flight talking in the open space between cabins, and eventually one of the crew asked if we wanted to see the crew rest, given that it wasn’t in use. Heck yes! So we walked back through economy, which didn’t look too bad (I’ve flown it around Toulouse before, and it really isn’t that bad). The crew rest was located at the very back of the cabin, and looked reasonably comfortable, though I do always find crew rests to be quite claustrophobic. Soon enough we were about 90 minutes out of Frankfurt, just passing over Eastern Europe. The service was so slow during the flight that I didn’t bother ordering a pre-arrival meal. Well that and I really wasn’t hungry, given that I just had breakfast a couple of hours prior. My friend Gino was aboard (also the first passenger of Etihad’s The Residence), and Qatar Airways had baked a cake for him. Like, no joke, they made a cake for him which said “Welcome On Board Our A350 Mr. Gino.” They presented it to him towards the end of the flight. No one else got a cake, but Gino was kind enough to share a slice, and it was tasty! About 30 minutes out the captain came on the PA to give us updated arrival information, saying we’d be touching down shortly after noon. At this point I returned to my seat and turned on the tail camera to watch the descent. While it looked like a nice day in Frankfurt, apparently it was really windy, and you could feel it on the approach. It was especially evident when we were on approach and you could see our crab angle. There were lots of minor adjustments on the final approach, and eventually we had a firm touchdown at Frankfurt Airport. From there it was roughly a 15 minute taxi to the gate. I don’t think I’ve ever felt as special taxiing in as on this flight. Literally every single ground employee stopped their vehicle or turned around to take pictures of the A350. It was clear that the airport was making a big freaking deal about it, since literally everyone seemed to notice the plane. Eventually we arrived at our gate, where we had quite the welcome committee greeting us. Once off the plane there was a great angle from which to view the A350. Though after a couple of mostly sleepless days I was ready to head to my hotel for some rest. The A350 is a gorgeous plane. Does it have the amenities of the A380? Nope. But it’s quiet and efficient, and from a passenger comfort standpoint, definitely has an edge over the 787 (it’s wider, quieter, and doesn’t have those annoying dimming window shades which don’t actually work). 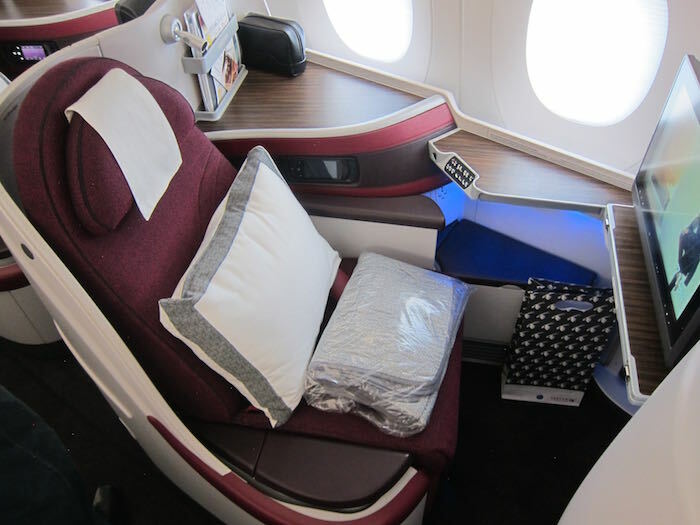 Qatar Airways business class service is impressive. 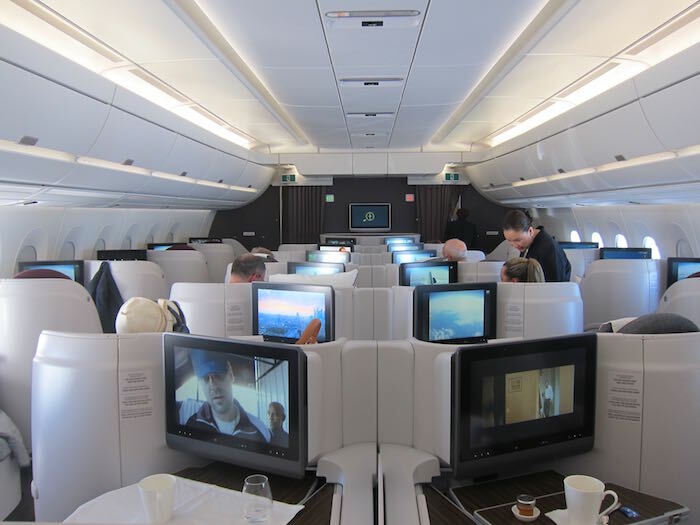 On the flights which are operated by aircraft with their reverse herringbone product, I’d say it’s one of the most solid business class products out there, between the food, seat, entertainment, etc. Service on this sector was well intentioned though poorly executed. That being said, I can hardly blame them, given that it was their first A350 “performance,” and we weren’t the easiest crowd to navigate around. 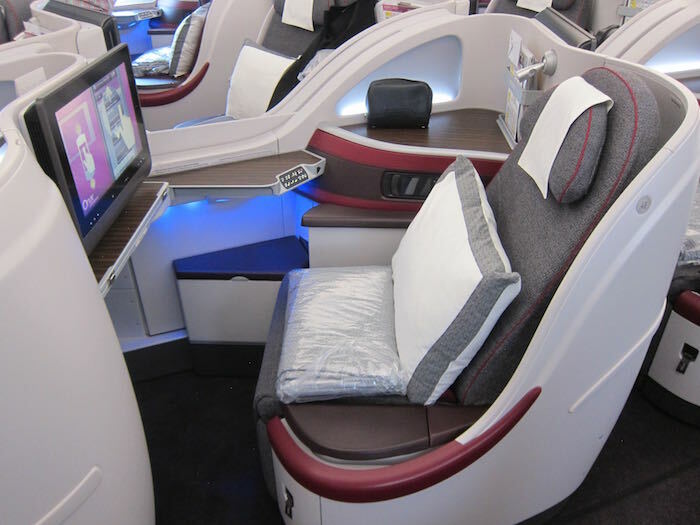 Now if only Qatar Airways would fly the A350, A380, or 787 to the US, rather than the 777 (which doesn’t feature their reverse herringbone business class product). Overall I was impressed, and had one of the most fun flights of my life, thanks in no small part to my fellow passengers. I can’t wait for more airlines to take delivery of the A350! AAdvantage & Dividend Miles To Merge On March 28, 2015? Does This HAVE To Be The Most Direct Way From New York To The Maldives?! Now I am hungry and thirsty. does his excellency drink alcohol on board? Nothing was missing from the Arabic breakfast, it was just plated badly. Thinking out loud, Heather cho definitely wasn’t germaphobe! Awesome review. Love quiet planes. And it looks like this will be my favorite aircraft type. Too bad Boeing didn’t make the 787 quiet or wide or with real shades. 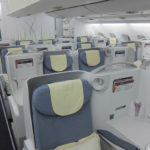 Lucky, based on this flight and your previous experiences with their airlines, if you had to pick one which business class product to fly for ultralonghaul, which would you pick (based on based on product, service, their hub, etcetera).for a “wow, that’s how you do it” introduction to premium travel? @ Jonathan — I’d probably do Qatar (especially if A380) > Etihad > Emirates. @ Lantean — He didn’t. Only two weeks ago I flew YGN-DOH at 8:am, a seven hour flight in J, so very similar to yours. However, to my surprise we did not get pajamas, so I specifically asked a FA about it. Later on the Service Director came up to me and explained that that was the case because it was a daytime flight. Pretty inconsistent I must say: a new – lesser – service offering? Every day I quietly pray that the 777-300ER I’m scheduled to fly from DOH-PHL in November will be replaced with an A350. Seems like a good route for the aircraft. Do you think he’s legally allowed to consume alcohol on a flight? It’s not hard to imagine that international regulations might loosely consider him, as an airline employee, to be crew on a flight and therefore have a zero-tolerance policy towards consumption of alcohol. Or maybe it is. I dunno. From an engineering perspective, what is the rational for the curved wing tip? Also, what qualifies one for the title his excellency? CM – I thought that the winglet at the end of the wing is to help reduce the drag impact of the vortices that occur due to different pressures below and above the wing. No water cannon for this inaugural? @ Al — Nope! I was kind of surprised. After reading this detailed account about the public relations flight, I’ve got only one question: Did you purchase one of the aviation photography books prominently displayed in the business class snack area authored by Sam Chui? @Thomas – Someone in corporate communications probably thought QR should put a little more effort into wooing someone the likes of Gino. 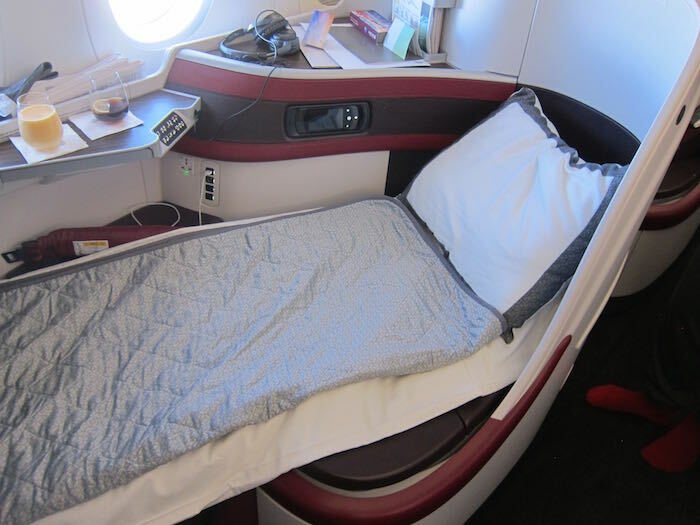 I flew both a night time flight from doh-arn and a day flight from cpn-doh both on the 787 in November and no mattress pad or pajamas were offered. The amenity kit also was much smaller and ferragamo. 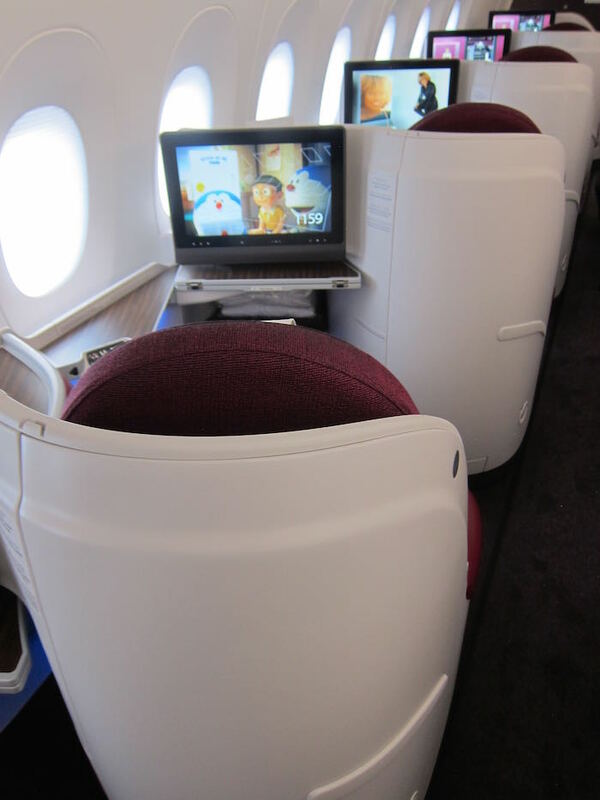 This may be brand standard on the a350 but not on the 787. 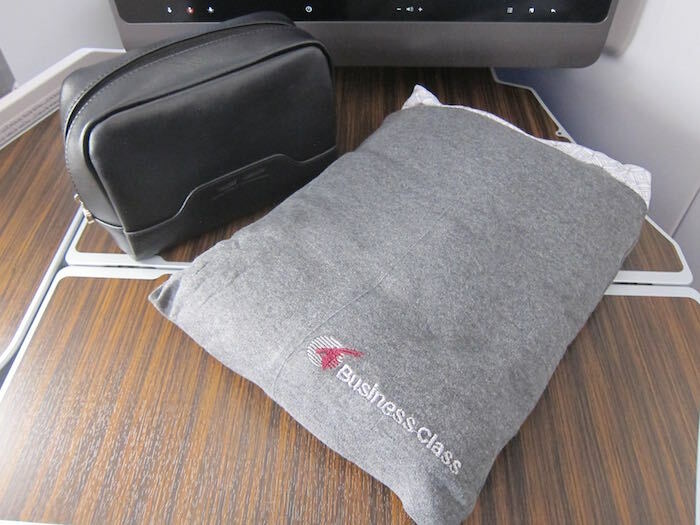 Does anybody know if the matress pad, pajamas and Armani amenity kit are offered on regular A350 flight ? Or is it just a one time thing, since it’s an inaugural flight and His Excellency is also flying. There isn’t any slippers offered, is there ? 2) DOH-JFK 8:00 am, 14 hrs, B777-300ER: all four items were available. They’re flying the A350 to Singapore next! Awesome. Hi! Great review! I just have a question. I never flew in anything better than economy class, so I don’t know if all of that stuff that you ate, drank and used were free. Especially all those drinks. And if you wanted some more, would you just ask for it and they would have given it to you for free? Thanks for the answer! @ Alex — Yep, all is free, and can typically have as much as you’d like, as long as they have enough for everyone. Thanks for reading! Flying the a350 in J together with a partner, which middle row would you take – row 2? 6? 7? 8? 9? Thanks for this great review. I wish this had not been an inaugural flight, so I could get a better feel for the service, but still fantastic pics. 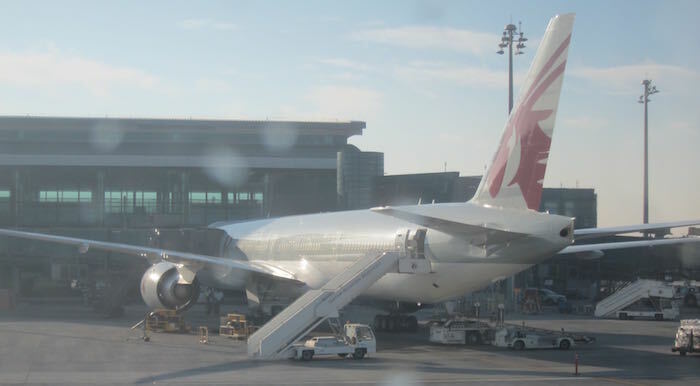 The plane looks so beautiful, I just bought a ticket from BOS – DOH on the A350 for my trip to AUH later this year. 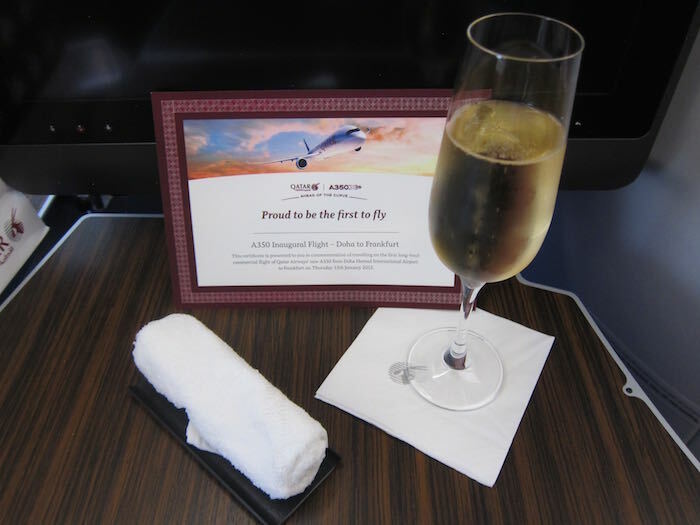 The price for two of us was only $12,000, which is half the price Etihad was charging for their business class. I think that’s a steal, considering the level of service Qatar seems to provide. Can’t wait to experience it. Lucky the seats on AA and CX’s 777-300ERs were designed by Cathay Pacific and built by Zodiac (AA then licensed them from CX), these seats were designed and built by B/E aerospace, a competing company. I enjoyed my flight. The cabin was comfortable and felt luxurious. The service was wonderful and warm. 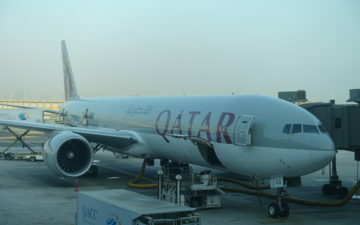 The initial delay and rude airline official really frustrated me, as I’d assume the staff at the home airport would be the best-trained, but that may not be fair to Qatar Airways. Thanks for the good review, I will be flying the A350 biz later this year so it’s good to have. 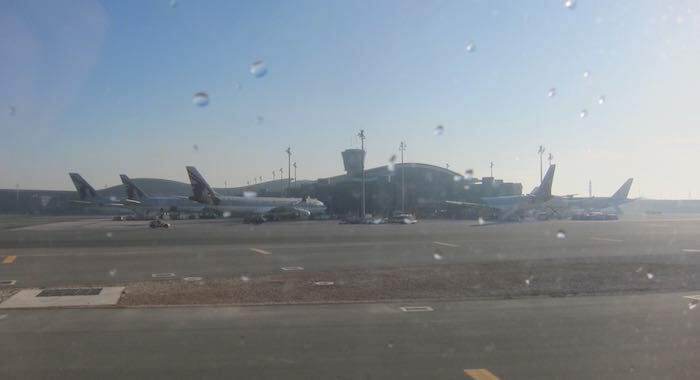 A few corrections though… DOHA only has one runway, so it was RWY 34, not 34L. And one of the pictures approaching FRA says “view on final approach” is inaccurate. Looks like you are parallel to the runway, so you would be on the downwind. On final, the runway is directly in front of you.